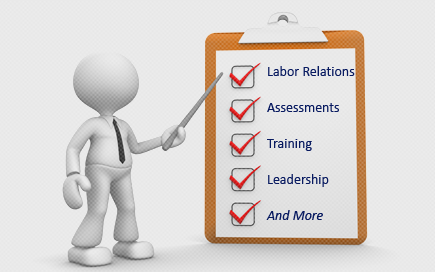 Labor Relations News Update March 2, 2015 | Oliver Bell, Inc.
Products are outperforming crude oil. The only bright spot in the oil complex. Refinery capacity and refining companies. Crude oil continues to be in a range. So far, the price of active month NYMEX crude oil has been playing out just as expected with active month futures closing out the month of February at $49.76 per barrel. After spending the last six months of 2014 free falling, the price of crude oil has found a trading range in 2015. While attracting lots of attention, conjecture and commentary a ten-dollar range between $45 and $55 per barrel has contained the price of April NYMEX crude futures this year. 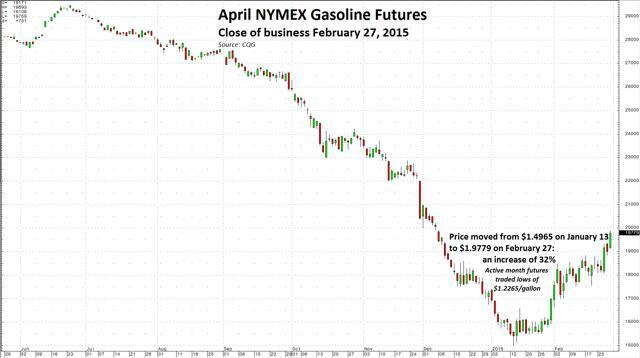 There continues to be conflicting signals out there when it comes to oil prices. Those signals are pulling the political commodity in both directions. One thing is for sure, while the crude oil price may have gone to sleep, the price of oil products certainly has not. Last week I commented that oil products were outperforming the price of crude oil. This week they continued to march higher. Part of the reason is a refinery strike that began in the beginning of February. 6,550 workers are on strike at 15 plants including 12 oil refineries. This affects around 20% of U.S. domestic refining production capacity. However, many of the refineries continue to operate and talks between the union and Shell Oil Co, the U.S. arm of Royal Dutch Shell (NYSE:RDS.A) (NYSE:RDS.B), are now set to resume on March 4. Meanwhile, the strike has been spreading. Oil product prices began recovering before the strike commenced and while they may be exacerbating the rally in oil products, they are not the only reason for strength in gasoline and heating oil prices. Gasoline fell from over $3 per gallon wholesale in June 2014 to under $1.25 and heating oil from over $3 to under $1.60. Recent cold weather has helped spur demand for heating oil, as has economic growth and increasing consumer spending in the U.S. Heating oil is a good proxy for diesel fuel and stronger domestic economic conditions have increased demand for goods that need to be transported, which increases fuel consumption. When it comes to gasoline, bargain basement prices increased demand for the commodity as prices were less than half what they were just a few short months ago. Although we are coming to the end of winter, a season where demand for gasoline is generally at a seasonal low, the price of gasoline has taken off since making lows in January. Driving season is just around the corner as is the potential for even higher prices. The following daily charts illustrate just how strong the rebound in heating oil and gasoline has been since January. Comparing the price increases in each with their increases relative to the price of crude oil itself is shocking. The 27.5% increase in the price of April heating oil futures in just over a month is impressive, but the move in the heating oil crack spread has been nothing short of amazing. As the charts show, products are outperforming crude oil by a long shot. They are the only bright spot in the oil complex these days. 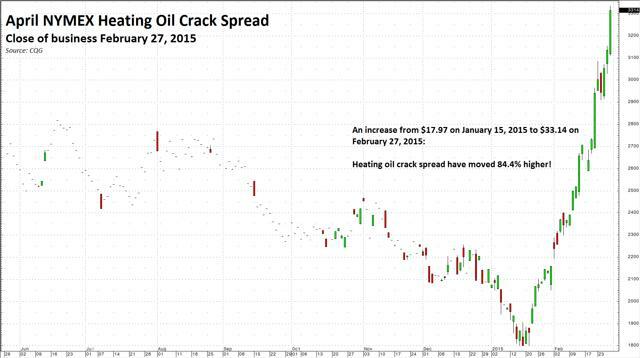 Crack spreads, or refining spreads, have been shining like a beacon in oil since January. As the charts show, the move higher preceded the current refinery strike. Cheaper products, cold weather and a growing U.S. economy have increased demand. On the supply side, the latest Baker Hughes rig count shows a steady decline. Last Friday, it fell again and now stands at 39% below the October peak, which is not negative for price. However, crude oil continues to flow and inventories are rising – they now stand at 434.1 million barrels. Inventories are increasing each week lately even though they are at record high levels. Brent versus WTI crude continues to reflect the oversupply of U.S. crude. 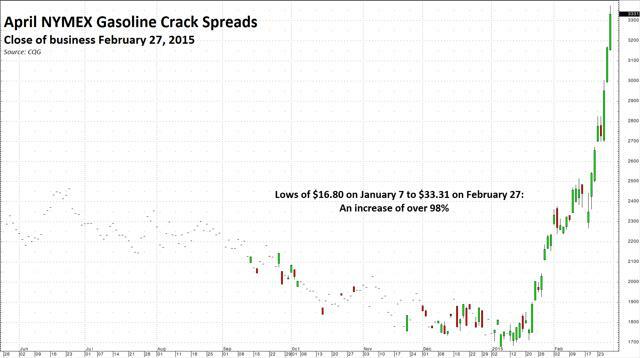 This past week the spread moved higher and closed at $12.82 on the April contracts on February 27. That represents an increase of $3.41 on the week, the Brent-WTI April spread closed at $9.41 on February 20. The Brent versus WTI spread traded down to flat in January – the recent rally in the price of Brent relative to WTI is a statement on the oil glut in the United States. Term structure also remains bearish. 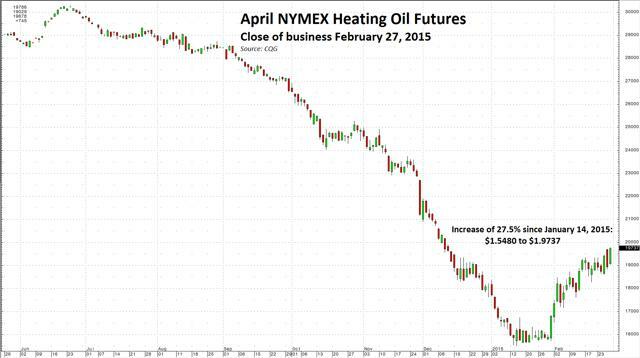 The April 2015 versus April 2016 NYMEX spread closed on February 27 at $12.19 or 24.5% premium for the deferred NYMEX crude oil. The April 2015 versus April 2016 Brent spread closed at the end of February at $7.29 or 11.65%. The narrower contango in Brent reflects the higher price level of Brent benchmark crude. The wide contango in the crude oil market highlights the surplus of oil in the market and remains a bearish factor. In the world of crude oil, refining spreads and the price of oil products stands out as perhaps the only positive thing that oil has going for it at this time. Despite the ongoing refinery strike affecting 20% of refineries, U.S. refineries operated at 87.4% of their operable capacity in the week ending February 20, according to the U.S. Energy Information Administration. Refineries will be switching from heating oil to gasoline as the seasons change. Driving season in the United States could see a huge increase in demand for gasoline as drivers will be paying far lower prices than last year. Right now, when it comes to the energy business, refining oil into products is king. The strike has helped move prices higher but it is demand for oil products in a growing U.S. economy and lower nominal prices that is providing the impetus for prices to move higher and remain strong. Unfortunately, for the rest of the oil business, the news is less rosy. If it were not for the current demand for oil products, the price of active month NYMEX crude would be much lower, perhaps below $40 per barrel right now. Oil remains supported by product prices; however, location spreads and term structure inventories of crude continue to weigh on the price. If there is a settlement in the refinery strike, it is likely that product prices will pull back. Therefore, I believe that the current range of $45-$55 will contain prices for active month NYMEX crude oil futures given the market’s current conditions. On 1 January 2015 changes that were introduced by Federal Law No. 421-FZ “On Amending Certain Legislative Acts of the Russian Federation in Connection with the Adoption of the Federal Law ‘On the Special Assessment of Working Conditions’” (the “Law”) concerning the establishment of new grounds and conditions for administrative penalty for violations of labor legislation came into effect. · the period of limitation to institute administrative proceedings was extended from two (in some occasions three) months to one year from the date the violation was committed. On 31 December 2014 Government Regulation No. 1595 “On Introduction of Changes to Several Government Regulations” was published on the official government website of legal information [gov.ru] (the “Regulation”). According to the Regulation, the obligation to formalize a business trip by a business trip certificate and duty assignment was cancelled. Currently, for accounting purposes, employees are only obligated to present travel documents. When employees use personal transport the actual period of being on a business trip is indicated in the memo, then obligatory presented by the employee to the employer along with supporting documentation (e.g. route sheet, bills, receipts, cash register receipt, etc.). In order to comply with the new rules our clients are advised to consider changes concerning the regulation of labor relationships in order to avoid administrative penalty. The changes affecting the formalization of business trips will reduce the burden for accounting and human resources departments in organizations and facilitate documentation process. After years of avoiding confrontation, the US labour movement is reasserting itself. From the ports of Los Angeles to the car plants of Detroit, unions are demanding payback for sacrifices they say helped revive the economy. Oil workers have walked off the job for higher wages and better working conditions. Dock workers have snarled West Coast ports. Personnel staffing oil terminals at the Port of Long Beach, California, are threatening to strike. In Detroit, union leaders girding for contract talks this year will push for the first raise veteran autoworkers have received in a decade. Campbell’s combative rhetoric evokes an era when unions had the clout to win significant lifestyle upgrades for their members. Wielding the threat of strikes and work slowdowns, organised labour helped generations of Americans join the middle-class and stay there. In recent years, however, globalisation and weak economic growth have hollowed out union power. In 1979, 21 million American workers belonged to a union. By last year, 14.6 million did. In the 1980s, strikes averaged 75 a year, according to the Bureau of Labor Statistics. Last year, there were 11. Harley Shaiken, a labour professor at the University of California at Berkeley, has long watched the ebbing of union power and wondered if walkouts were an endangered species. The surge in labour unrest has caught his attention. Shaiken says the main catalyst is inequality, considered the defining economic challenge of this era by everyone from President Barack Obama to Republican presidential aspirant Jeb Bush. Slow wage growth figures in deliberations by Federal Reserve officials as they consider whether to raise interest rates above zero this year. Even with unemployment near the lowest level since 2008, central bankers have expressed concern that low wages could restrain household spending. On Thursday, Wal-Mart Stores Inc., America’s largest private employer, said it would raise wages to $9 an hour, well above the $7.25 federal minimum wage. The move, by a retailer that has thwarted unions trying to organise its stores, strikes back at critics who say it underpays employees. A 2011 study drew a link between the decline in union membership since 1973 and expanding wage disparity. Those trends have since continued, said Bruce Western, a professor of sociology at Harvard University who co-authored the study. Union workers say they took a hit on wages and benefits after the financial crisis to help keep companies and the economy afloat and expect to be rewarded for their sacrifice. “You don’t want to be the senior partner in failure and the junior partner in success,” said Gary Chaison, a professor of labour relations at Clark University in Worcester, Massachusetts. Since 2009, management compensation has grown about 50 per cent faster than union workers’ income. In the auto industry, real wages have declined 24 per cent since 2003, according to the Center for Automotive Research. In Detroit, Dennis Williams, the United Autoworkers’ new president, has made getting his members a raise a top priority in contract talks with General Motors, Ford and FCA US, formerly known as Chrysler Group. And he’s not above rattling the strike sabre. Williams stressed the importance of the right to strike. During the last contract talks, in 2011, the UAW gave up that right at GM and Chrysler to help the automakers recover from their bankruptcies. Now, that power has been restored. The current four-year auto contract expires September 15. “The right to collective bargaining is a building block to good economics, shared prosperity, a strong middle class and a country that believes in balanced democracy,” Williams said in a statement. The Detroit Three are loath to increase their labour costs since that’s what helped nearly drive them out of business. They prefer to reward workers with profit sharing checks that can shrink or disappear in tough times. Detroit autoworkers have received record profit sharing for the last five years. But Detroit’s automakers may have to boost wages, said Art Schwartz, a former GM labour negotiator who now runs Labor & Economics Associates, a consulting firm in Ann Arbor, Michigan. If the UAW wins traditional wage increases, “that will embolden other unions to try and get more,” Schwartz said. The United Steelworkers, which represents oil refinery workers, is seeking better wages, benefits and restrictions on the use of non-union contract workers. The companies are expected to use the worldwide collapse in crude prices as a cudgel in negotiations, but the unions may dig in. When oil workers across the country last walked off the job, 35 years ago, the strike lasted three months. “The oil companies think they have a strong case because the international price is down so much, but they have made such phenomenal profits in the past, they don’t have a strong case,” said Chaison, the labour relations professor.